Cork's All-Ireland bid crumbled at the semi-final stage today as Kerry finally got the better of their arch rivals this summer, succeeding by 0-16 to 0-10 at Croke Park. The Rebels, winners of last month's Munster final, failed to match the scoring power of Kerry's Mike Frank Russell and Colm Cooper, who struck 0-10 between them in front of a 58,703-strong crowd. Three points from Cooper (0-02) and Russell at the tail end of the first half saw Jack O'Connor's side turn around with a 0-08 to 0-05 lead. The Kingdom – now set for their third successive appearance in an All-Ireland final – never looked like losing their advantage, although James Masters (0-05) was a constant threat, albeit from placed balls. In a game that truly failed to fire – lots of unnecessary fouls blighted what could have been a classic – Cork got the better start with Conor McCarthy, their only change to the side that defeated Donegal, left-footing over after three minutes. With selector Ger O'Sullivan directing operations on the sideline, while the suspended Billy Morgan watched from the stands, Cork settled admirably but it was not too long until they faced Kerry's first aerial attack. The ploy worked to a tee against Armagh, with the 6ft 5in Kieran Donaghy getting the better of Francie Bellew for a neat goal – and the Tralee man almost repeated the trick five minutes into today's encounter, when he rose to greet a Russell bomb and fended off Cork skipper Derek Kavanagh. A low shot would have beaten goalkeeper Alan Quirke, but the young full-forward's over exuberance saw him opt for power and Quirke got his body in the way to block it away. Kerry regrouped and Sean O'Sullivan sent over a stunning point from a sideline ball on the left flank to signal the 2004 champions' intent. Cork were not to be out done, and Morgan's men took in the quarter-hour with a 0-03 to 0-01 lead – Masters (free) and full-forward Donnacha O'Connor, swivelling brilliantly onto his right boot, added scores. Yet an early injury to pivotal midfielder Nicholas Murphy, who was forced to play on regardless, saw Cork bullied in centre-field with Darragh Ó'Sé on top, ably assisted by Kerry’s rampaging half-back line. Cork were making little use of their meagre share of possession and hit only two wides to Kerry's six in the entire first half. They ended the half with just two points from play also, with a brace of frees from Masters taking their tally to 0-05 on the half-hour. Clever use of the ball saw Kerry dominate the half's latter stages – Russell angled over a point from the left wing, Tomas Ó'Sé made up for an earlier miss with a right-footed score and Donaghy then teed up Sean O'Sullivan for a 29th-minute point which put his side in front for the first time at 0-05 to 0-04. A Masters free was followed by three on the bounce from the Kerry attack with Cooper's injury-time free the best of the lot – the 23-year-old stand-in captain showed his mettle with a sweetly driven shot from an almost impossible angle on the right. 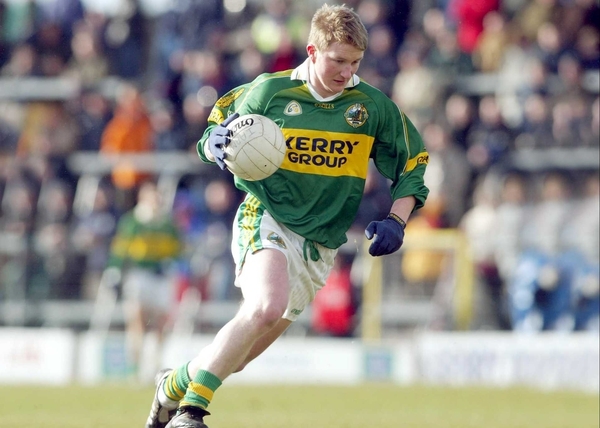 Russell, a player who was roundly criticised for the amount of wides he clocked up against Armagh, continued to do most of the damage after the break as his accurate kicking put Kerry four, and then five points clear. There seemed little that Cork could do to force their way back into contention – when they did drift high balls into the square, Darragh Ó'Sé was perfectly positioned to deal with them, and their best goal chance was fluffed too when O'Connor fed Kevin O'Sullivan in the 54th-minute but the substitute was crowded out with the terrier-like Mike McCarthy blocking his shot behind for a '45. O'Sullivan had sent over a skyscraper of a point minutes earlier to cut the gap back to three – 0-10 to 0-07 – but Kerry controlled matters for the closing 20 minutes to set up what could be the first Kerry-Dublin final since 1985. This year's other semi-finalists Dublin and Mayo will hardly have been worried by what they saw at headquarters this afternoon – Kerry never hit fifth gear, and they never needed to. The result seemed inevitable as every Cork point was cancelled to at the far end, and with equal aplomb. Cork full-forward O'Connor, who emerged with a good deal of credit, notched his second point to make it a 0-12 to 0-08 game, but it was quickly followed by scores from substitute Declan O'Sullivan and Donaghy. Donaghy's point was the best of the game as the increasingly dominant Ó'Sé started it with a catch under his own crossbar. The ball was worked downfield to Paul Galvin before it was sucked into the giant hands of Donaghy, who was out in front of Kavanagh to collect and rifle over. O'Connor, easily Cork's best forward, then caught a high ball and laid off for Seanie O'Brien to point a reply but the game was coming to a dull end – not even Masters' first point from play, a booming shot from the right, could draw any life out of the red shirts. Cooper confidently closed the deal with his third free and another well-hit shot from out on the right flank. It was economic stuff from the Gooch, but Cork frustratingly got their sums all wrong – this was a big chance for them and they blew it. The Rebels have not won a semi-final now since 1999. Three times they have met Kerry in the last-four of the championship in recent seasons, and three times they have been beaten by their neighbours, including the heavy defeats of last year (1-19 to 0-09) and 2002 (3-19 to 2-07). KERRY – D Murphy; M Ó Sé, M McCarthy, T O'Sullivan; T Ó Sé (0-01), S Moynihan, A O'Mahony; D Ó Sé, T Griffin; S O'Sullivan (0-02 (0-01 sl)), E Brosnan, P Galvin (0-01); C Cooper (capt) (0-04 (0-03f)), K Donaghy (0-01), MF Russell (0-06 (0-03f)). 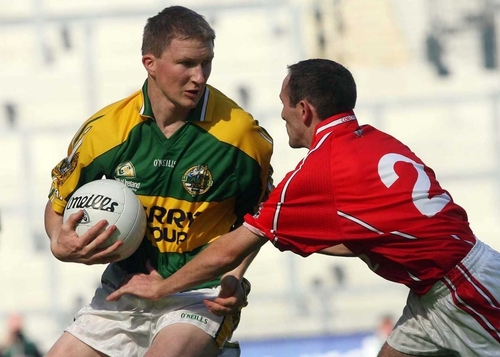 CORK – A Quirke; M Prout, D Kavanagh (capt), K O'Connor; M Shields, G Spillane, A Lynch; P O'Neill, N Murphy; S O'Brien (0-01), C McCarthy (0-01), K McMahon; J Masters (0-05 (0-04f)), D O'Connor (0-02), J Hayes.